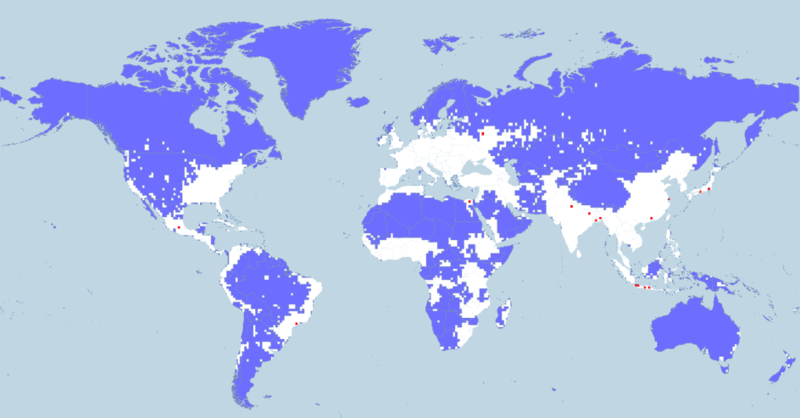 Just 5% of the world lives in the entire blue area. Another 5% lives in the red area. This is a follow up to yesterday’s post on world population density. Several people thought the map would be more meaningful if it were done as an equal area projection. 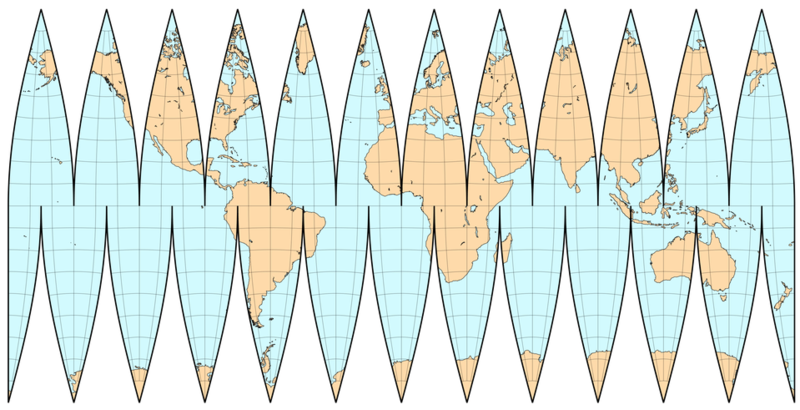 For non-map geeks, an equal area projection is a way of stretching the map so that the area of every object is proportional to its area in real life. More below. A few people also pointed out that the colored areas of the map were chosen arbitrarily, which is true. To build the map, I manually chose territories so as to make the blue area large, and the red area small. I don’t see anything inherently wrong with constructing the map that way, but it had me wondering what the map would look like if it was created in a non-arbitrary way. What are the biggest and the smallest possible areas that contain exactly 5% of the world population? To answer this question, I looked to NASA’s gridded population data, which is something like a high resolution zoom for world population. 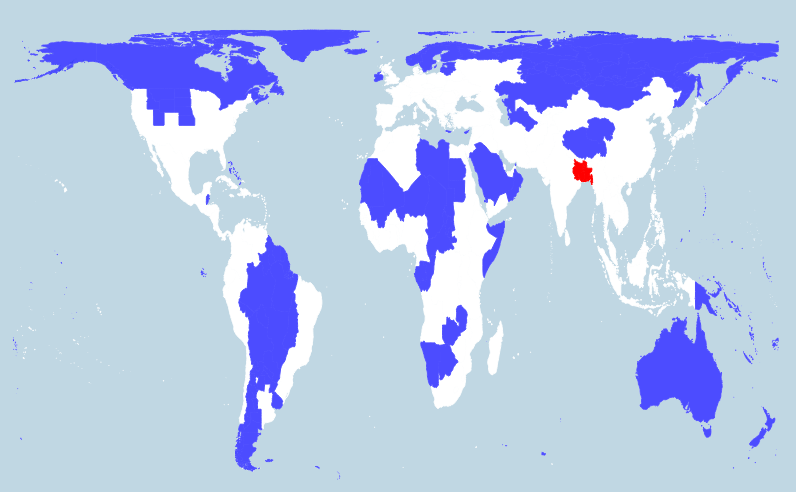 With it, I calculated the largest possible blue area and the smallest possible red area, subject to the constraint that each area contain exactly 5% of the world population. Here is what they look like. 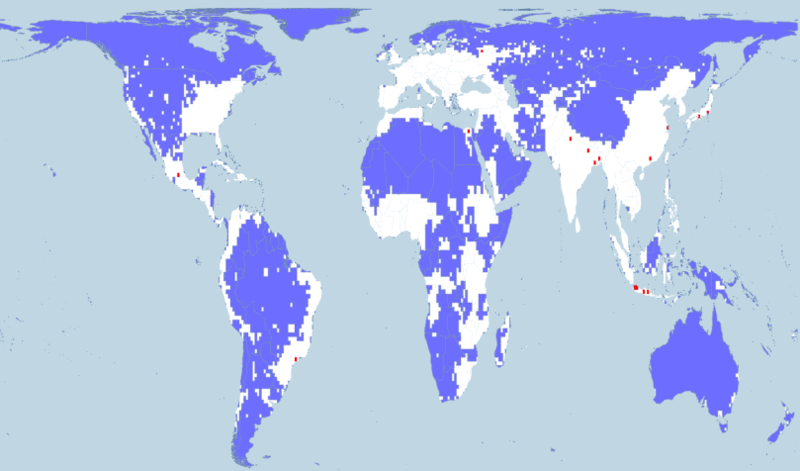 In total, the blue area covers 72% of the Earth’s land. The red area covers just 0.1%. There are 17 red dots in the map. Can you find them? Can you guess which dot has the highest population density? Since the world is spherical, it is impossible to draw it on a flat surface without distorting it in some way. The prior map does so using a Mercator projection (technically, a modified version called a Miller projection). It is the world map that most of us are used to seeing, but it drastically distorts the size of objects as they approach the poles. For example, it makes Greenland appear almost same size as South America. In reality, Greenland is about ten times smaller! Here is what the same map looks like using a Gall-Peters projection, which preserves the relative size of objects. Notice how much smaller Greenland is compared to South America. These are their true sizes. The shape of Greenland is also very different. 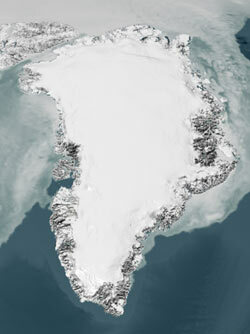 It is now much shorter and flatter, which is not what Greenland really looks like. Compare the map with this image from NASA. The Gall-Peters projection is more accurate in terms of sizes. But it is less accurate in terms of shapes. Here is what the original map looks like using Gall-Peters. In a technical sense, the Gall-Peters projection is probably a more correct way of showing the world in this case, since it accurately depicts the relative areas of the different regions. But when you first looked at this map, what is the first thing that jumped out at you? Was it the colored regions that first caught your attention? Or was it the simple fact that the world looks weird? The purpose of this map is to communicate a fact about population density. So why confuse things by throwing in a world map that most people have never seen? I am probably in the minority among map geeks, but I think the Mercator projection is usually the better map to go with because everyone has a frame of reference for interpreting it. If technical correctness were truly the most important thing, we should really be using an interrupted projection, which is more accurate for both the size and the shape of objects. This clip from The West Wing sums up the issue pretty well. Previous Article How is the Trump Campaign Spending its Money? Or just use a sphere, webgl is pretty fast these days. would be interesting to see biggest and smallest contiguous area. If allowing gaps over water of certain size (or even including water as valid surface), it can cross to Americas. Also a very good suggestion. For that one it would probably make sense to be able to cross water. A big portion of the world lives in the islands of Southeast Asia. Interesting thought. Would it make sense to allow “holes” (i.e. Russia w/ Moscow carved out)? Is it contiguous if you link two places together with a skinny line? Appreciate the suggestion. That would be a fun one to work on. I feel like you’re presenting an artificial dichotomy. The Mercator is a terrible projection. The fact that it has huge cultural inertia in the USA does not change the fact that it is a terrible projection. The Gall-Peters is also a fairly poor projection, it skews too far in the opposite direction. It is not much more “accurate” than the Mercator (sorry, West Wing), it’s just wrong in a different direction. (Incidentally, I think you’ve used the Gall stereographic rather than the original Mercator, but the point still stands). The interrupted projection isn’t really much of an improvement: because of how our brains work, we are inclined to “fill in the blanks” rather than interpret the map as slices of a globe, so we end up recreating something like a Mercator anyway. What is needed is compromise. I personally feel that the Robinson is the best balance of preserving area and shape, but others such as the Winkel tripel are also decent alternatives. The projection on a Winkel tripel that appears in the comments of your original post is a good illustration: the shapes are all still clearly recognisable, but the areas and distances are much closer to the truth. Agree with you for the most part. I wrote this post in response to a few people who specifically mentioned the Peters Projection, but you’re right there are many other options as well. There are many good compromise projections like the ones you mention. And if I had to do it again I may go with one of those instead. Not sure. There is still a familiarity drawback, which is especially important here since there are no country borders to help people orient themselves.